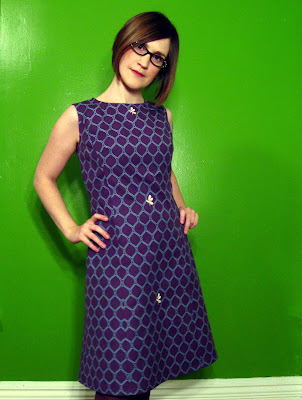 Some friends had a "Thanks for Nothing" leftovers party on Saturday, and I wore my new dress. Woo hoo! I used Cyndi's awesome invisible zipper tutorial to install my first invisible zipper (thanks Cyndi!). This was also my first lined garment. Basically, I just made a second dress exactly like the first. I made it slightly shorter, in a lightweight silk fabric, and attached it at the neck, zipper, and armholes. More pictures and details on my blog. Let's get right into it shall we? The official Sew? I Knit! "Comeback Project" is The Holiday Party! Since the holiday season is already upon us, why not incorporate some sewing. From November 15 to January 15, we'll be focusing on sewing garments to wear to various holiday festivities and celebrations. The projects can range from something as fancy as a gown for your company holiday party to something more casual for your family get-togethers or a fun and flirty dress for New Years. Whatever the garment is, it has to be worn over the holidays. I hope you all are excited about this as I am. It's time to hit those pattern books and shuffle through the pattern stash. Let's get ready to sew! I just wanted to say hello and I'm super excited to join y'all. I just had my birthday and got a lot of the 'basics' I need to REALLY work on my sewing (I've had a machine since April and have made a pillowcase, a pair of PJ pants and a jersey T-shirt. . . . all in a class). You can see my haul of goodies here. Yay for re-energizing!! Hello fellow Sew? I Knit-ers! We would like to apologize for the unanticipated absence and lack of activity for the sewalong. Mari, Stephanie and I have been extremely busy over the past months with life in general. We know you know how that goes and hope you understand. There will be some changes happening here at Sew? I Knit! Unfortunately because life happens, Mari and Stephanie will no longer be co-hosting. I'd like to thank them for all the time and effort in creating and helping maintain this sewalong. The good news is that the sewalong will go on, but with a few modifications. And without further ado, the next project, the official "Sew? I Knit Comeback" project, will be announced on Friday, November 9th! This next project will have a two month time frame. The Quarterly Project cycle will begin in the new year. Until then, have a great week everyone!